I am enjoying the Montmaray Journals by Michelle Cooper, which began with A Brief History of Montmaray. 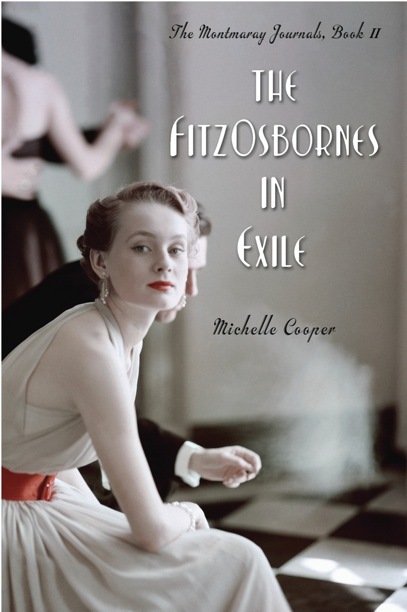 In The FitzOsbornes in Exile, the royal family of Montmaray is living the 1930's London upper class life some of us have come to know and love from various novels and Masterpiece series. Unlike the first Montmaray novel, which I found difficult to categorize, this one is probably a formulaic England-under-the-cloud-of-coming-war story. I felt A Brief History of Montmaray had an odd plot because the event that changes the world for the characters and sets everything in motion didn't start until halfway through the book. The Montmaray Journals brings serial novels to historical fiction, something that we usually see with fantasy, and the event that changes the world for these characters this time occurred at the end of book one--the Nazis force the royal family out of their island kingdom. In The FitzOsbornes in Exile they don't really start dealing with that until, once again, halfway through the book. Initially, they are fish out of water, not fitting in with the shallow London debutantes because they've had a much rougher life, despite being royal. Then the rest of the book deals with them trying to get the world to recognize what has become of their country. Like the first book, this one even has a climax filled with physical danger, though I found it more improbable than what happened in book one. The FitzOsbornes in Exile probably suffers a bit from being the middle book in a trilogy. It's the book that pretty much acts as filler between the hook that caught readers' attention in the first place and the big finale, which in this case is going to involve World War II. I, for one, am expecting a big, big finale. As charming as the FitxOsbornes are, I can imagine them wearing on some readers a bit because they are so beautiful, intelligent, and noble. But I love the period details in these books. I am familiar with the Mitford sisters, who are mentioned a few times here, and Sir Oswald Mosley, who gets even more space. (He's almost a semi-regular on Masterpiece, turning up in both Upstairs Downstairs and, I believe, Foyle's War.) I certainly recognize the names Kathleen Kennedy and Joseph Kennedy, Jr., though I'm not sure how their presence adds to the story, unless their fates come into the third book. At one point, the main character is asked if she's been reading Machiavelli. "No," she says, "I'm reading Regency Buck, by Georgette Heyer....and it's got Beau Brummell in it." Regency Buck was published in 1935, making it a likely choice of reading material for a young society woman living in the late 1930s. And note that Sophia points out that the book includes Beau Brummell, who might be described as more of a historical celebrity than historical figure. She's mentioning a book that uses a real person from the past as a character, just as the book she, herself, appears in does. Kind of cool. As I said, I love the period detail. I wonder if you have to know the period to recognize the details, though, to play the history game. And if you can't play the game, does that lessen your enjoyment of the book? Since I can play the game, I will be reading the third book in the series, The FitzOsbornes at War.